The second of four posts from Marco Toniolo featuring amazing photos from his RockShox Experience in Bolivia this year with Rene Wildhaber and Jerome Clementz. 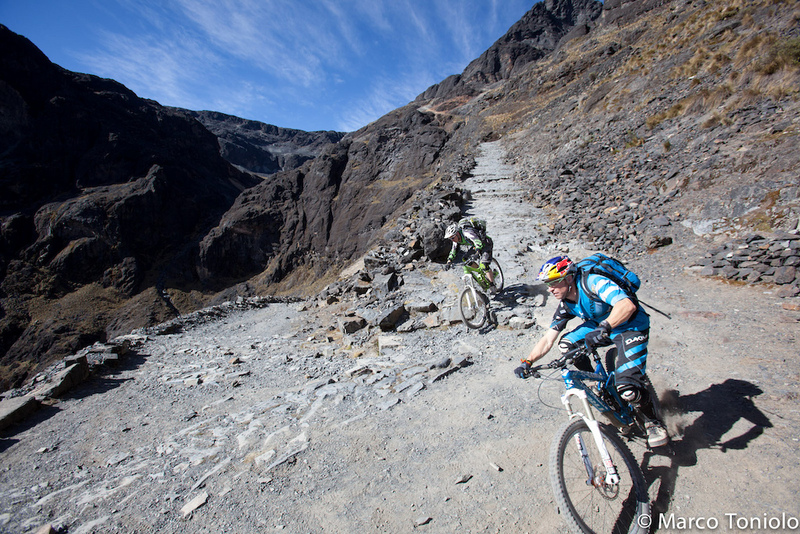 Imagine this: a 78 km downhill with a vertical drop of 3500 meters. You start at 4800 meters altitude and end up at 1300m. 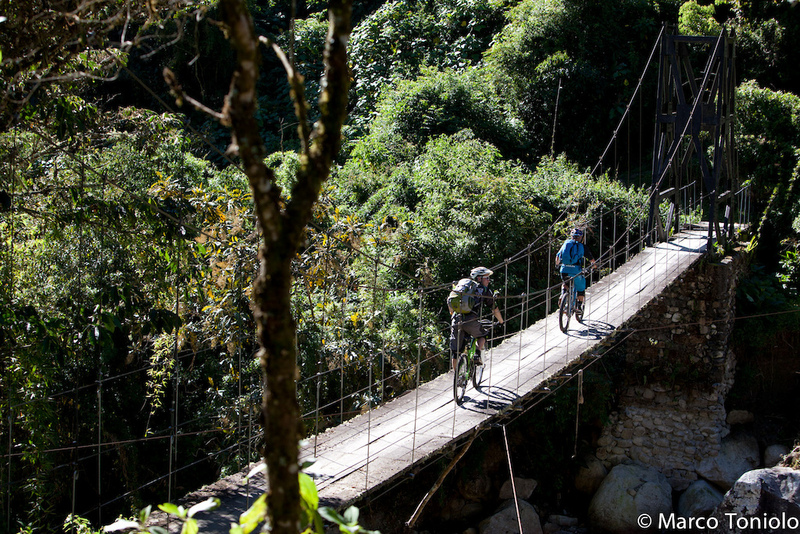 The most amazing thing is that you ride on an old and lonesome Inca trail, starting from high altitude landscapes and finishing in the jungle, not far from coca fields. 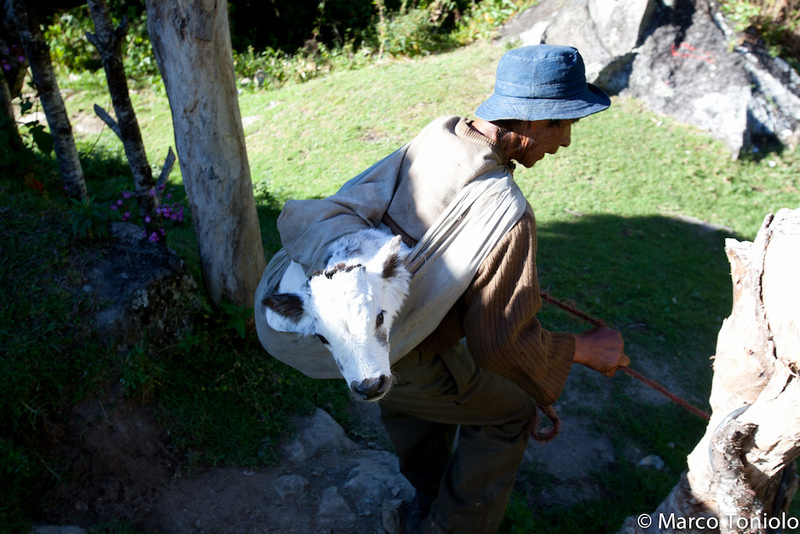 The beginning of the trail is actually a road, a very old one, built by the Incas. The view of it takes your breath away: a long line through a very long valley with some Inca ruins. It looks mellow, but it's not. Rough terrain, even if it's a road. The more we lose altitude, the greener the valley. Water flows from the faces of the mountains, some farmers live up here and take care of their lamas and sheep. We could ride this trail in one (long) day, but the video shooting takes lots of time, so our guide Alistair organized some porters that brought our sleeping bags, tents and some food to a camping site at 2000 m. altitude. The air is full of oxygen down here, our bodies get back into life and we are full of energy. So what about finding some beer? Rene and I decide to go to the next camping site, where there is a kind of bar with beer. It's a one hour walk from where we sleep, but we manage to get back with 5 liters of beer in 90 minutes. Yeah! And we find also a new way to open the bottles, watch the video to see how you have bought a bottle opener together with your bike - and you probably don't even know it! Machete is like a Swiss knife in the Bolivians mountains. We arrive at a place where a 79 year old Japanese guy lives, Tamiji Hanamura. He has never left this place since 1966, but he knows everything of our world from the tourists that come over. We sign his guestbook and he sits down with us. "You are from Italy, where exactly from in Italy? ", he asks me in Spanish. When I tell him the place he starts an impressing geography lesson. He even knows the altitude of the biggest mountains in Italy, as well the ones in Switzerland (where Rene comes from) and France (Jerome). It's 700 vertical meters left to the village where Germano, our driver, is waiting for us. They are simply sick: switchbacks, flowy parts and stunning views back to the infinite trail we have been riding during these unforgettable two days. Gravity Bolivia organized everything for us (there are two more locations and blogposts to come). The Lomo Lomo trail in Sorata has been built by Travis of Andeanepics. When I wrote the Sorata post the Andeanepics website did not work (you know, it showed those weird google ads..). 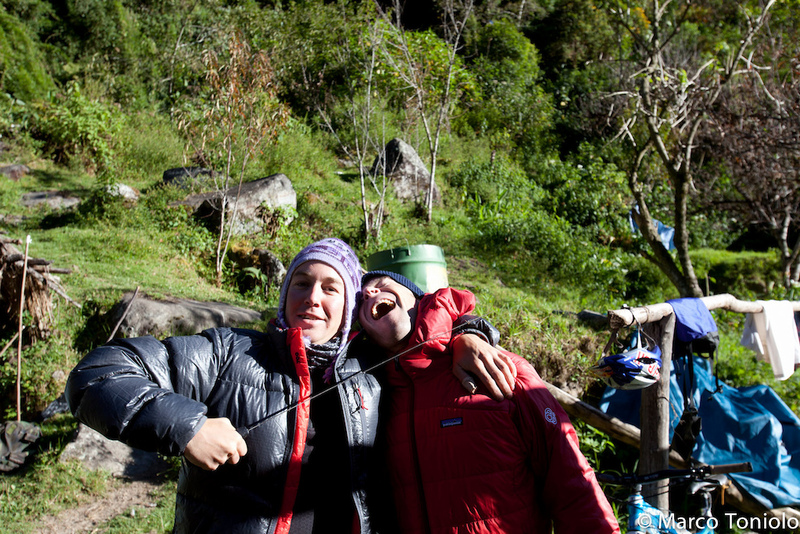 In Sorata there is going to be a downhill race this year: Doble Avalancha 2011 on October 2-3. Day One Loma Loma. Day Two Chuchu. That's all for now, stay tuned for more coming soon! This is the type of thing PB needs more of! Not just the constant boring samey DH and dirt jump videos we see day in day out! This plus a contest to go on the next epic film adventure. I hope PB includes more tipe of this reports, this is the type of news most people get stoked. Agree...bring on more epic trail rides and AM adventures, and tone down the DH and DJ. Don't mind them mate, just needs to be a better balance. And a bit more variety in the DH videos themselves as they seem to be stuck in a rut of all being the same. Aaaaaaaaah, that place look like ALL MOUNTAIN NIRVANA!!!!! Epic filming and photography ...more of this kind of article please! I trekked this exact trail ! Took me about 4 days to complete it! 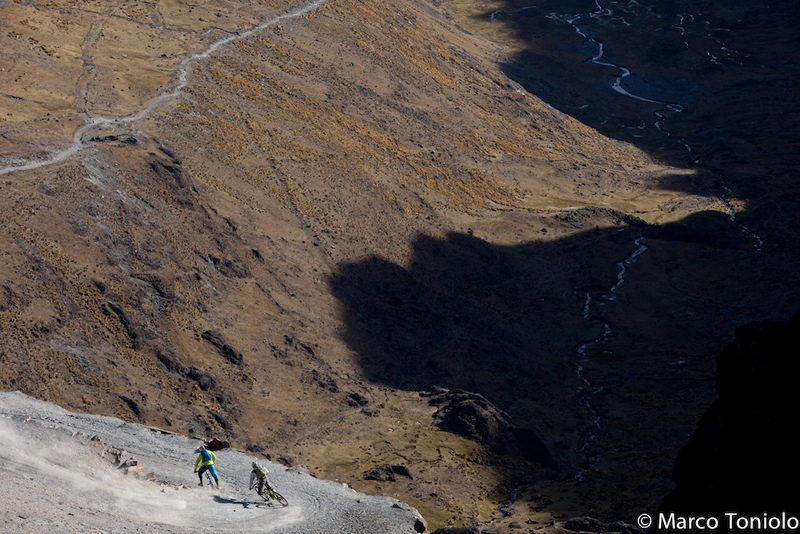 Its an amazing decent that starts at around 4600m and ends in a small village around 700m. 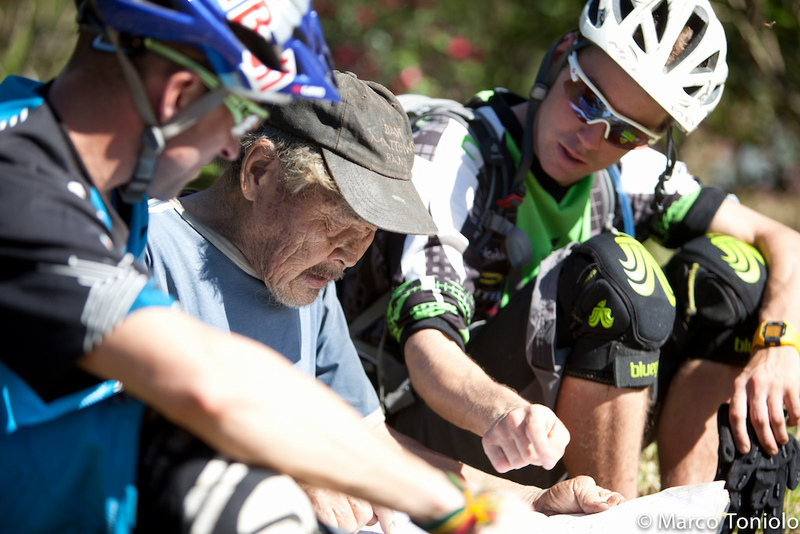 I can't believe I'm reading about this trail on a Pinkbike article what an epic adventure! Time to save up and head on over to Bolivia! 78km descent?! Think of the arm pump! I don't think this can top Peru Flo! Unless you can get the same awesome bunch of riders we had back then! Lol, Yeah the coastal desert around Lima is stunning! Riding Olleros, going from 3500m to sealevel in a day. That is pretty hard to top... Check my vids for some footage if you want to compare with your trip . Bolivia is bike heaven,you don't get a 78km decent any where let allone the beautifull landscape you are biking in. NOT THE FAMOUS BOLIVIAN ZIPLINE NOOOOOOOOOOOOOOO! really really stoked to see the photos. looking forward to an epic ride myself this summer! Looks like such an amazing place to ride. wow, insane, so wanna go! Whats the exact title of the first song? Agree 100%. I've never seen a vid that gave me that urge to ride more than this one. Although I enjoy watching DH and FR vids, I am an AM rider and this is the kind of riding I want to do. I'm sure there's a couple of minutes of uphill footage that got clipped. Would've liked to see those too, even if it's just a few seconds.